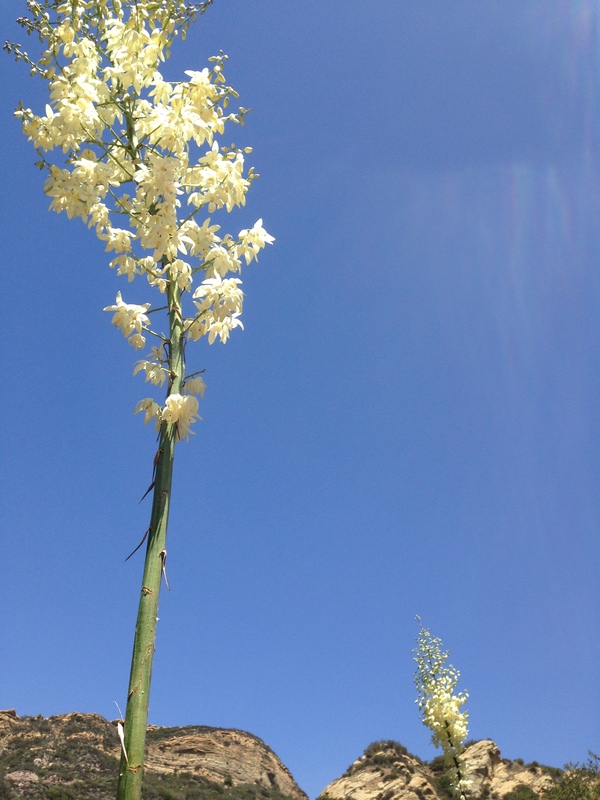 Magical yuccas bloom against the brilliant blue wind-swept skies at Red Rock Canyon Park in the Santa Monica Mountains. Whenever botanical diversity abounds, a beautiful sight is never more then mere footsteps away. Today, the Santa Monica Mountains were spectacularly in bloom. The colors of wildflowers and shrubs did not disappoint and the bees were all a-buzz despite the unrelenting winds in Red Rock Canyon Park. These are just a few of the lovely splashes of colorful flowers that met us as we climbed up rocky trails under the spring sun. Any hiker who has rubbed shoulders with dry, stratchy chamise in the summer, groans audibly when hearing ecological predications that this shrub will spread as climate changes. When it’s in bloom like this though, that future doesn’t seem so bad! Fuzzy purple and magenta flowers beacon pollinators, far and wide.